And so, day three dawned all frosty and misty, about -3C again. Right from the word go though, you could see the sun trying to break through and burn the mist away. Another promising start for a great walking day. 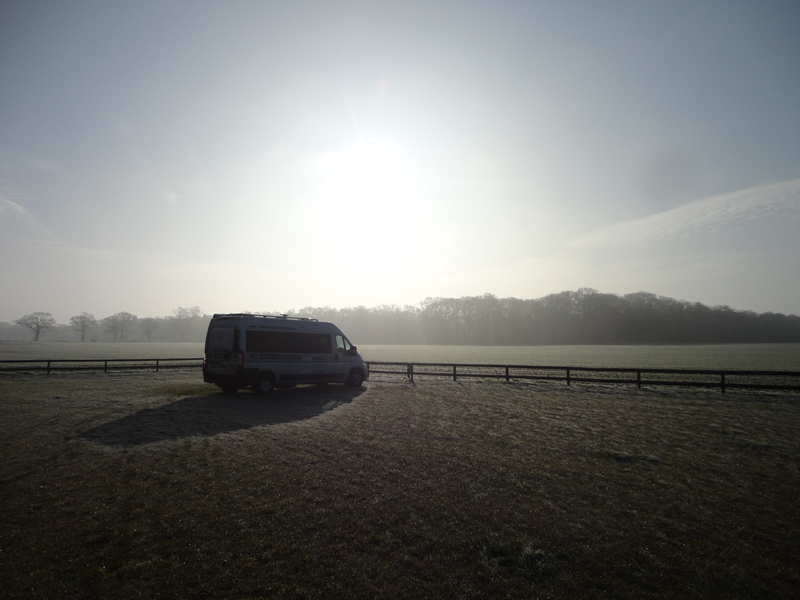 We’d spent this night on a small farm site so that we could do some ‘housekeeping stuff’, like fill up with fresh water, empty the waste out etc. 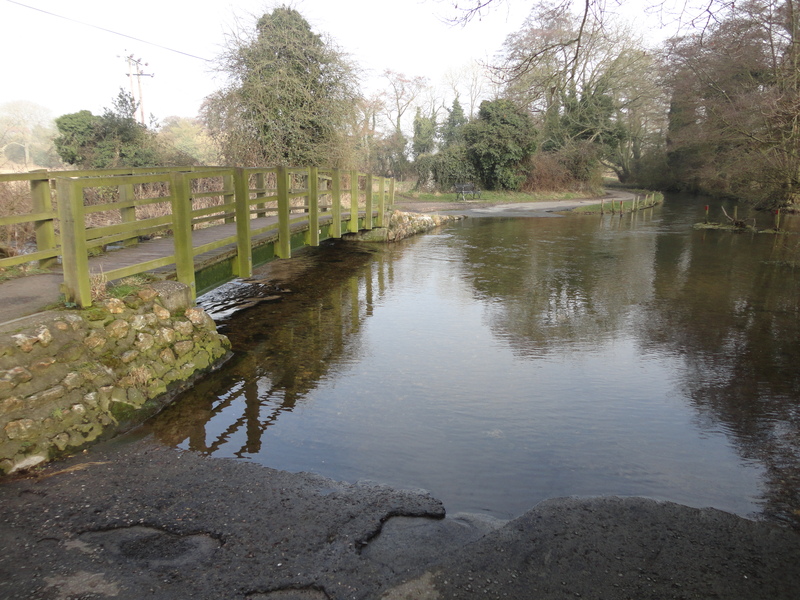 A very pleasant spot with a lovely, chatty couple running it. After seeing how tired Dixie was the day before, I’d spent some time the previous evening re-jigging my plans a little. 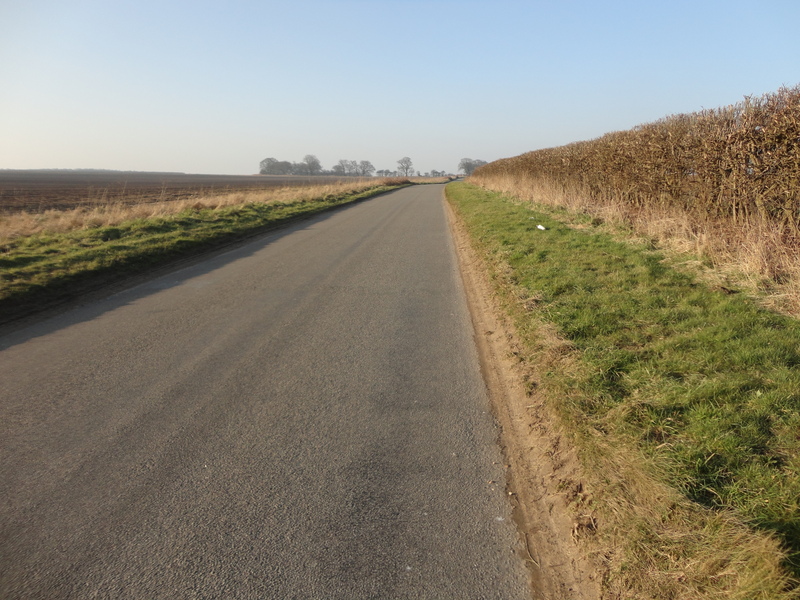 I’d decided that she was definitely going to have a rest today – so I’d do another 12 mile day on my own, but would then split the remaining 15 miles of the Way into 2 days, in the hope that she could join me again. So after a delicious, porridgey, golden syrupy breakfast, I was once again dropped off for the day’s walking, but this time without my special Boxer. The weather ended up being a bit of a tease in the morning. For a while I’d be walking in sunshine, with water droplets landing on my head from melting ice crystals on the trees, then the freezing fog would return for a bit, then the sun would make an appearance again – it couldn’t quite make its mind up. 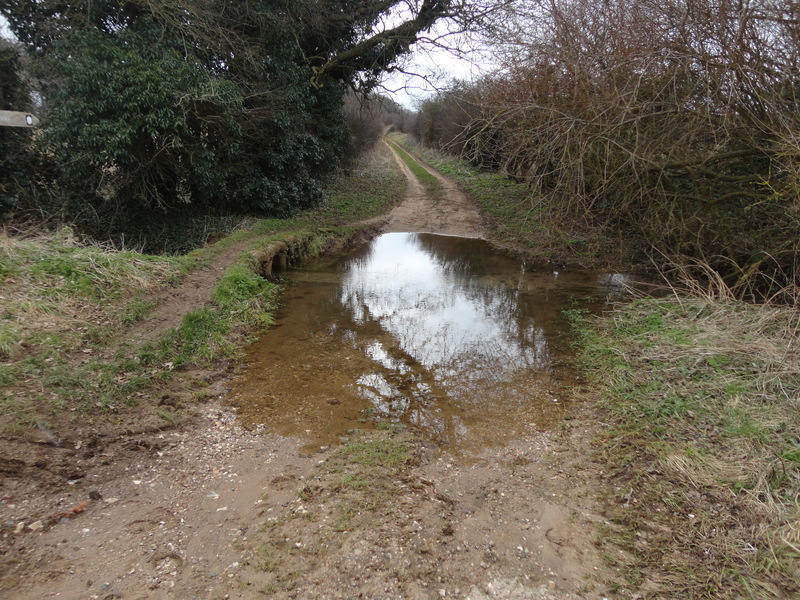 Still pretty perfect walking weather mind – dry, with no chance of over-heating! 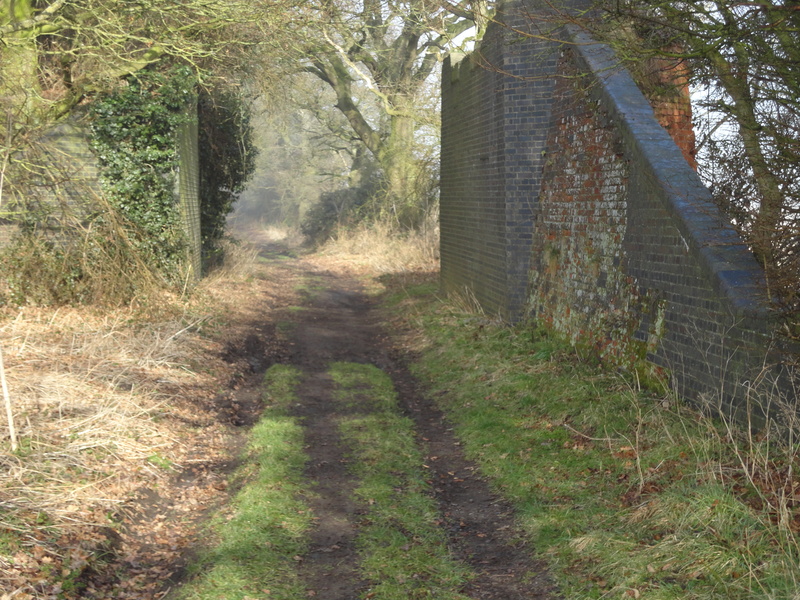 I followed what was obviously a disused railway line for a while and started to ponder on why it was that Norfolk seemed to be getting under my skin. No mountains – but it didn’t seem to matter. In fact walking all day without breaking into a sweat made a nice change! No fantastic Himalayan type views – but still expansive views, with huge skies which drew the eyes tantalisingly into the distance. And the solitude. I was walking for hours each day and hardly seeing another soul. It was no wilderness and yet it still felt wild and desolate in its own way – especially with the cold, north wind blowing inland, unhindered from the North Sea. 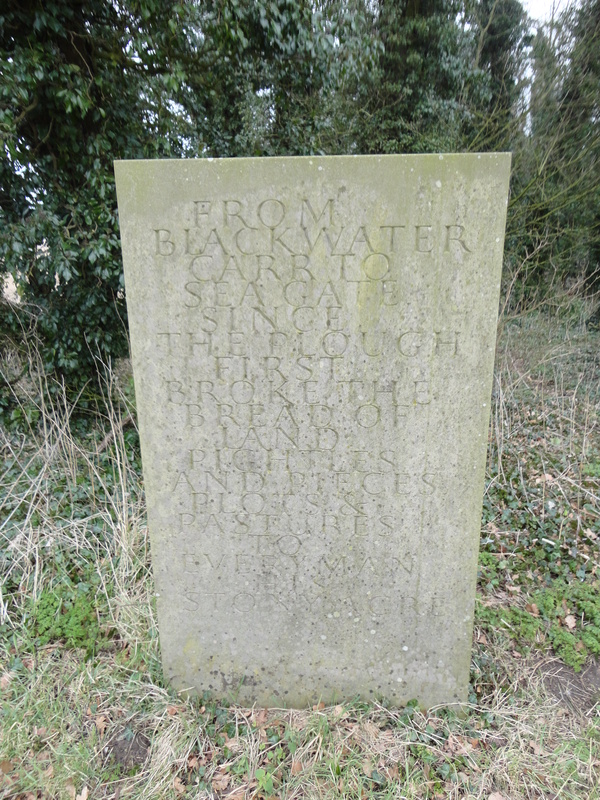 At several points along the way, various sculptures have been placed. 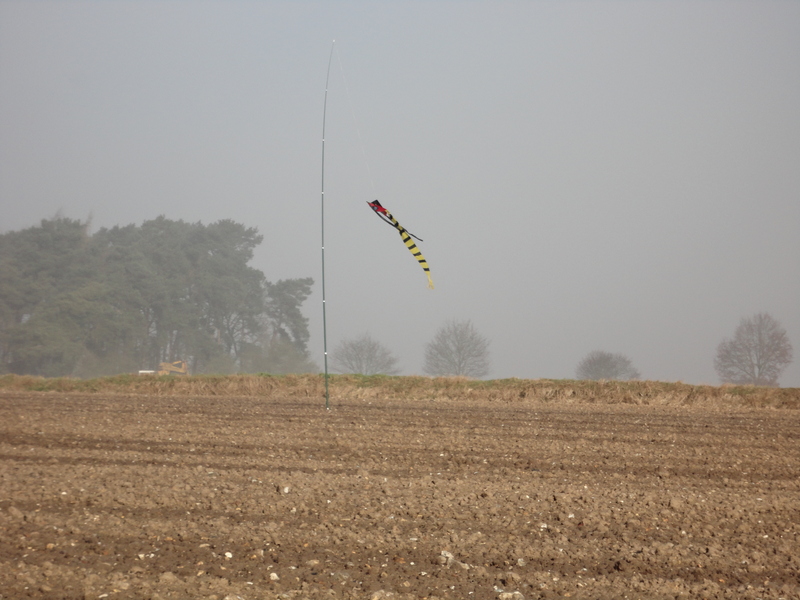 They are part of the Norfolk Songline Project, created by Hugh Lupton. 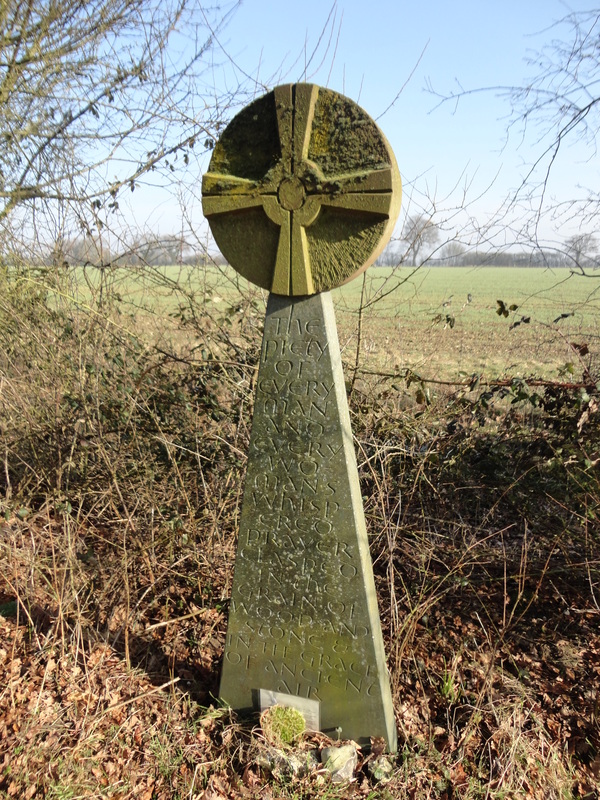 He used poetry, imagery and song to bring the landscape of the Peddars Way to life. A Songline is originally an Australian Aboriginal concept which explores connections between tracks and the landscapes they pass through. Not long before lunch time, I became aware of traffic noise in the distance. There aren’t many main roads to cross on the route – most of them are just tiny, side roads – but this one sounded like it was quite busy. By the time I’d had a break for lunch, the weather had turned reliably sunny and I headed ever northwards towards the coast. The next place I would go through would be Castle Acre and about a mile short of the village I turned a corner to a bit of a sad sight. 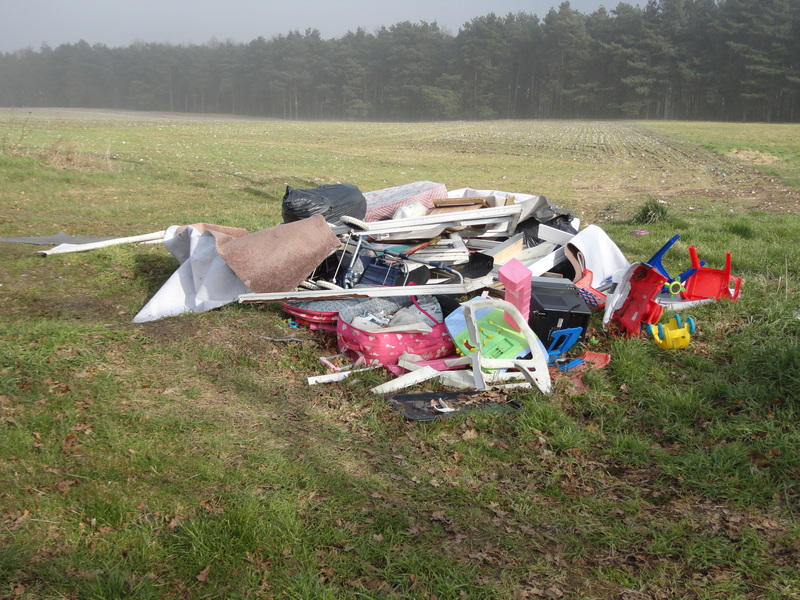 To be fair, fly-tipping is by no means confined to Norfolk. 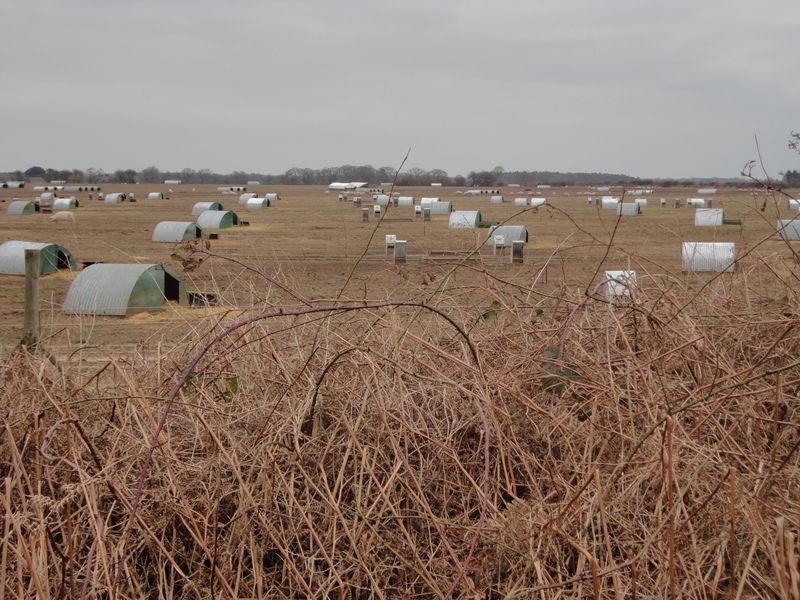 I’ve never understood the mentality of someone who can put in all the effort it takes to dump stuff in the countryside, as opposed to taking it to a tip. Brainless. 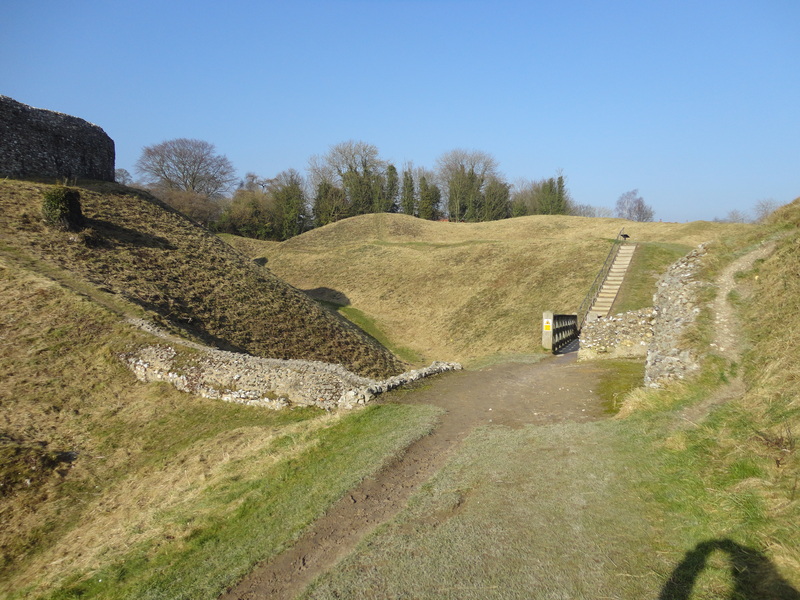 Still, Castle Acre was coming up and I was looking forward to it. In fact the castle ruins were even bigger and better than I’d expected. It was a lovely spot to sit in the sunshine, soak up the atmosphere and have a cup of tea. 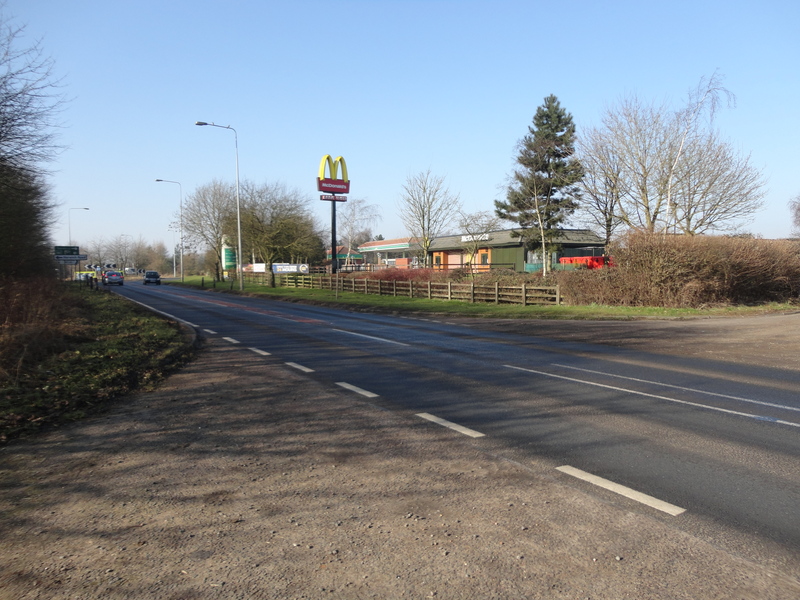 In actual fact, as I headed north again out of Castle Acre, there was a mini-supermarket. And for anyone else contemplating doing the Peddars Way, it’s worth noting that this was the only shop I noticed over the whole route. 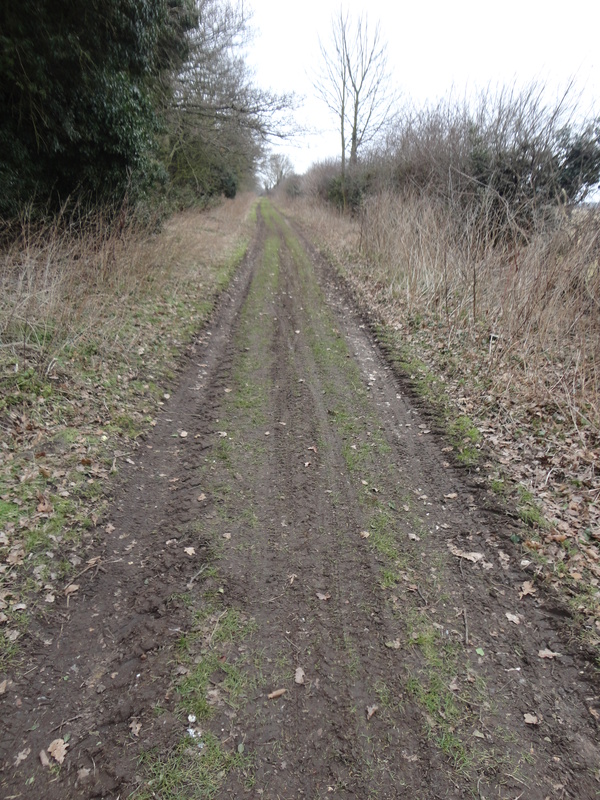 The last 3 miles or so of the day followed a tarmac road. 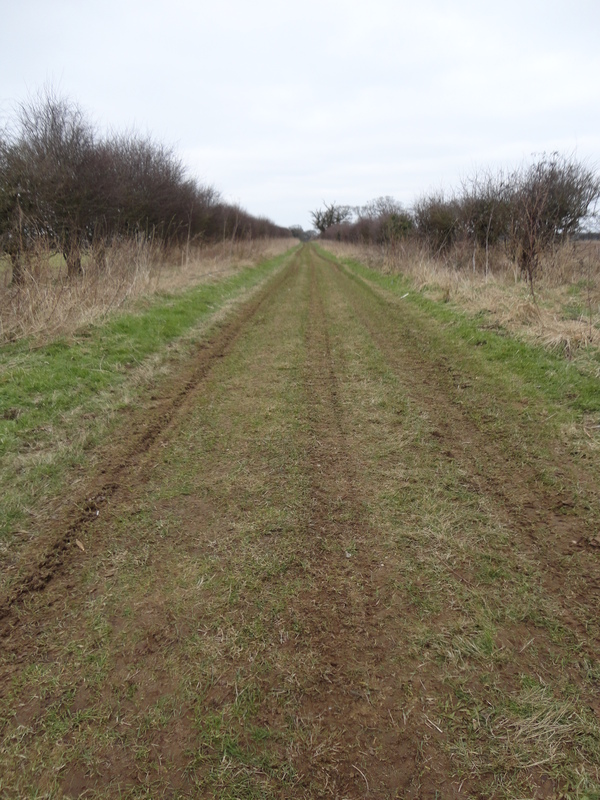 To be fair, for most of this section the path was either on the grass verge or in a field behind a hedge, but I actually stuck to the road as I was starting to feel a little weary and was making quicker progress on the tarmac. 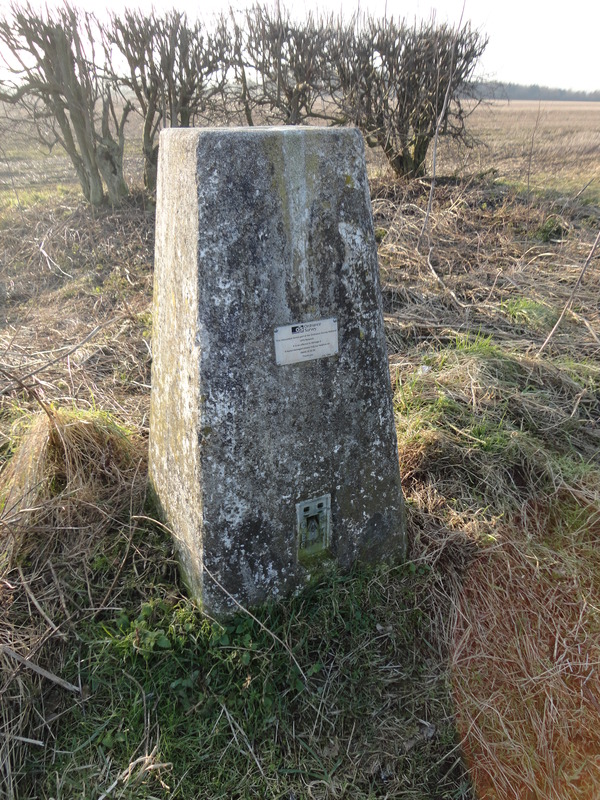 Shortly before meeting up with Geoff again I passed the trig point, that at 302ft (92m), marked the high point of the trail. It was all downhill from here……..
Dixie was much brighter this morning after her previous rest day but I made the decision to leave her with Geoff and Tilly for a second day, as she wasn’t quite bouncing around as usual. So, another day on my own, but much shorter – only 8 miles. The weather was colder. Around 2C all day, with a bit of a breeze and no sun. Almost as soon as I’d set off I passed another Songline Sculpture. And as I journeyed north this day, the path started to subtly change in character as the soil took on a more sandy texture and the route also seemed to become even straighter. More happy looking piggies were passed. 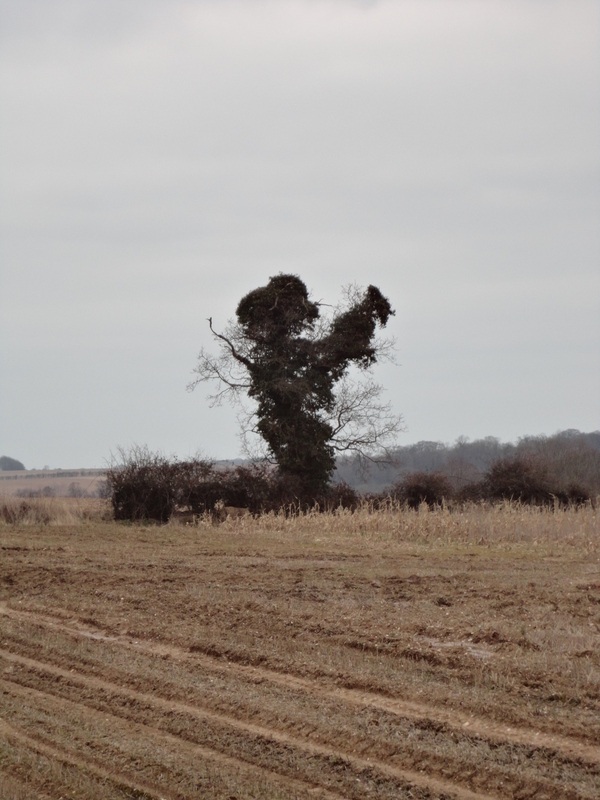 And more creepy looking Norfolk trees. Being only 8 miles, I seemed to be at the van rendezvous point almost before I realised it. 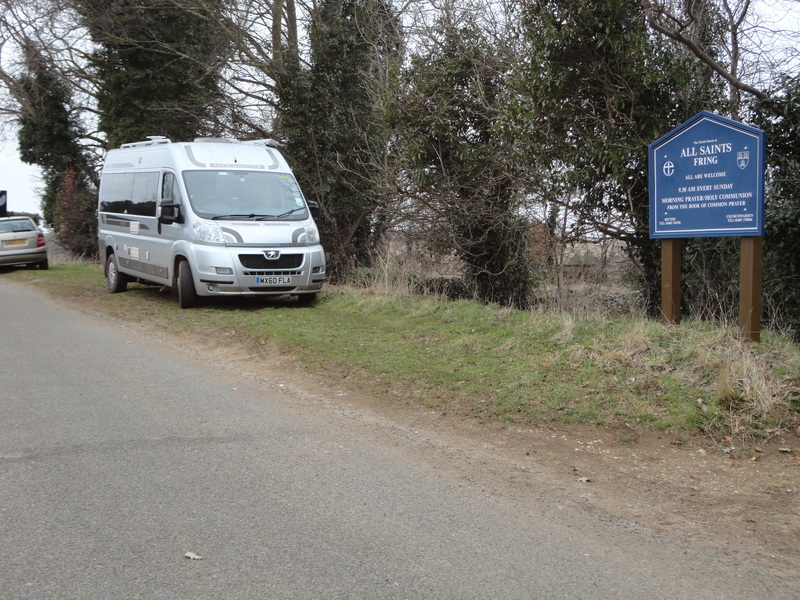 We were meeting up in the village of Fring and Geoff had already found the perfect, peaceful spot for us to spend the night – outside the church. Another cold, grey day dawned and Dixie was up and about, bouncing around, determined not to be left behind again. 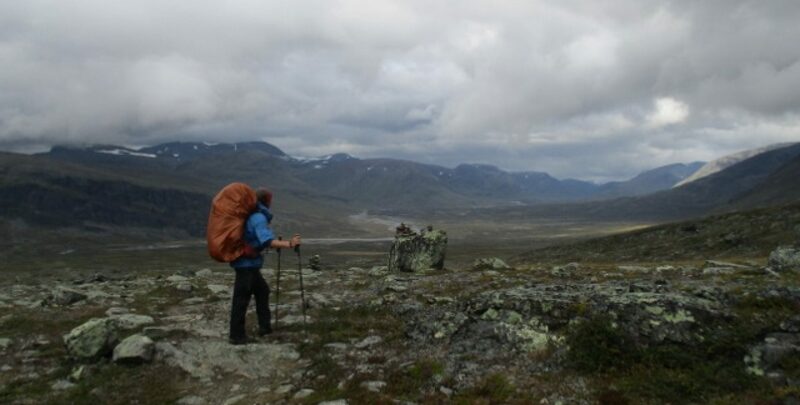 It was going to another short day – only 7 miles – and as we set off, the snow started! It didn’t last though……. Thankfully, Dixie seemed to be absolutely fine again, back to her normal skippety self. I think I need to practice my videoing technique though. By now I could smell the sea, bringing back childhood memories. That distinctive fresh, salty smell mingling with the crisp, cold air. As yesterday, the miles passed quicky with it being another short day. 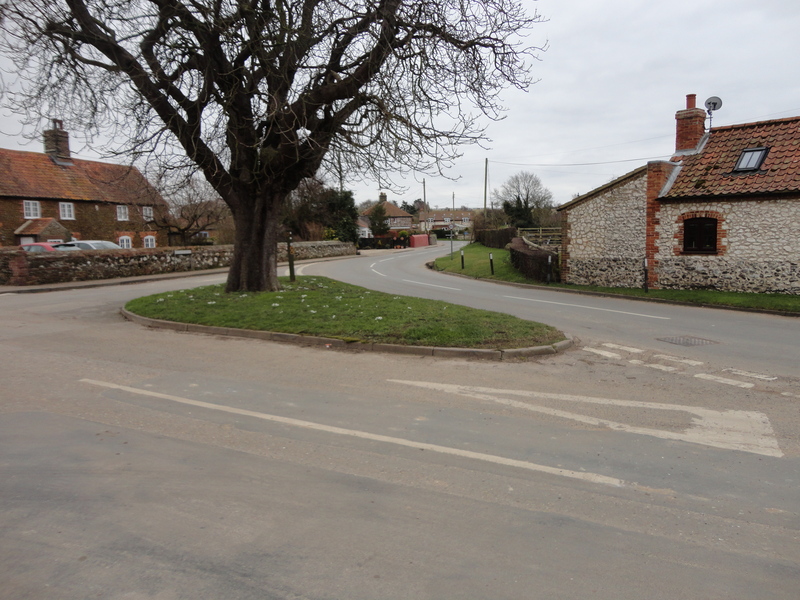 We were soon in the village of Ringstead. 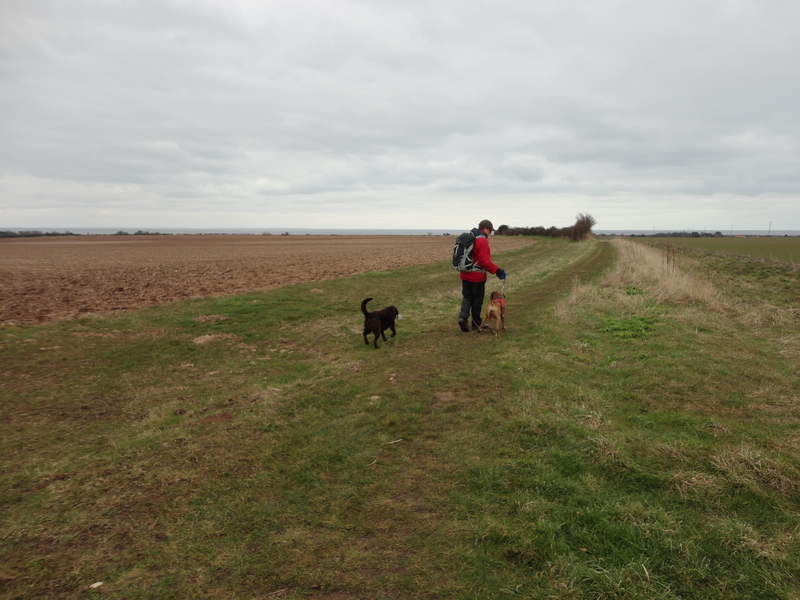 Ringstead is only 3 miles from the coast and the end of the trail, and as we wandered on through we suddenly saw Geoff and Tilly coming towards us. They’d parked up at the sea and walked south to meet us and accompany us on the last bit. You’d think the dogs had been apart for months the way they greeted each other as we all met up! So here we were, on the final leg. The final Songline Sculpture was passed. 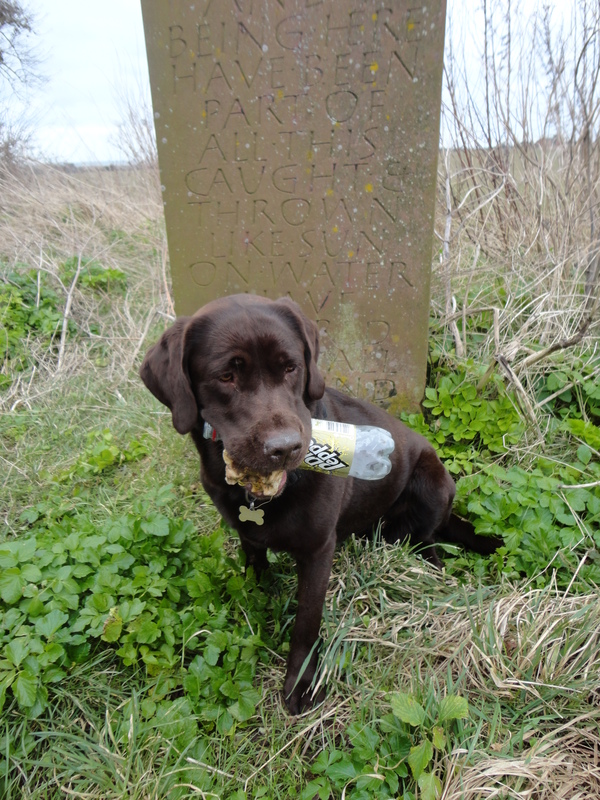 This one was entitled ‘Stone With Labrador And Plastic Bottle’. Isn’t it funny how the last mile can often seem the longest? 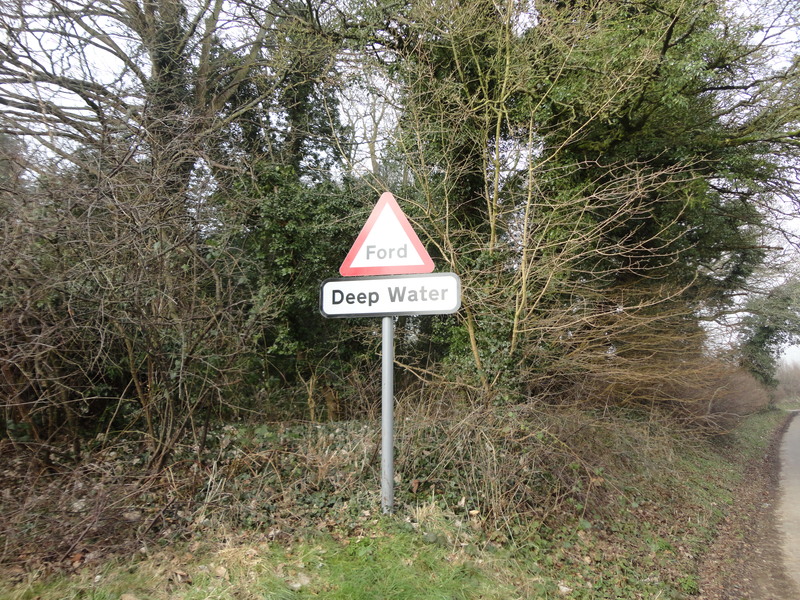 But suddenly, there it was, the sign marking the end of the route – or the beginning I suppose if you were walking from north to south…. And as far as Dixie’s concerned, since she walked the first day and the last day, she’s telling anyone who’ll listen that she walked the whole way. what a perfectly excellent little adventure, for wo-man and dog! Ruins too! I think you might have sold me on the Peddars Way. Looks smashing. I could well imagine you enjoying both the route and the ruins, Mark. There are also lots of birds to see, although there was no point in me writing about them as I can never remember what anything is! I just need a comfy van with a driver/quartermaster and I’m sorted! Hi Karen! Actually I think that Dixie is secretly a bit peeved that she didn’t manage every day, and it wasn’t really her fault. She says Mum should have known better and planned a bit of a shorter first day……. It would be nice to see some photos of Pennsylvania if you manage to get out and about – I’ll look forward to them. I biked it a couple of years ago. There are some lovely lanes. 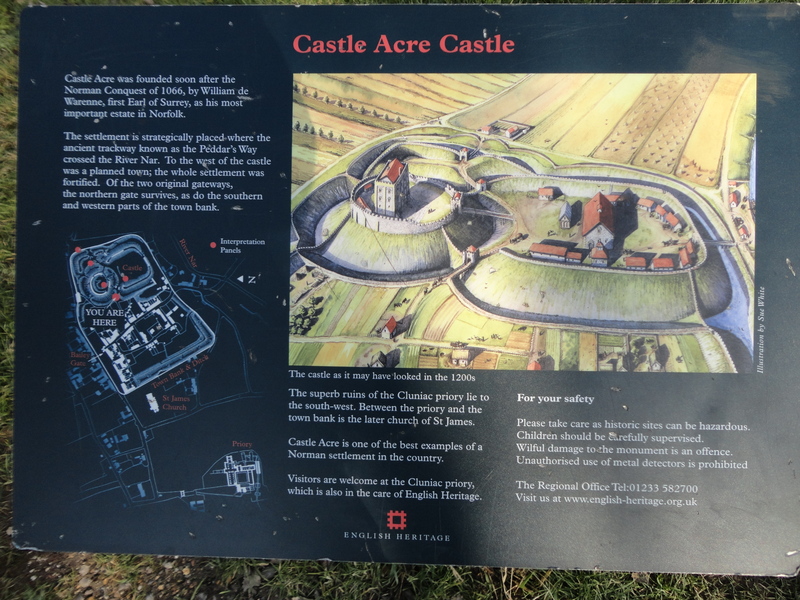 Did you go round the Priory at Castle Acre? Next time I am going to take our young dog. Not on the bike though. Hi Andrew, thanks for dropping by and leaving a comment! I did think about you at one point as I thought maybe you lived somewhere vaguely down that way??? I can imagine it being very pleasant on a bike too. Did you do it in just one day? 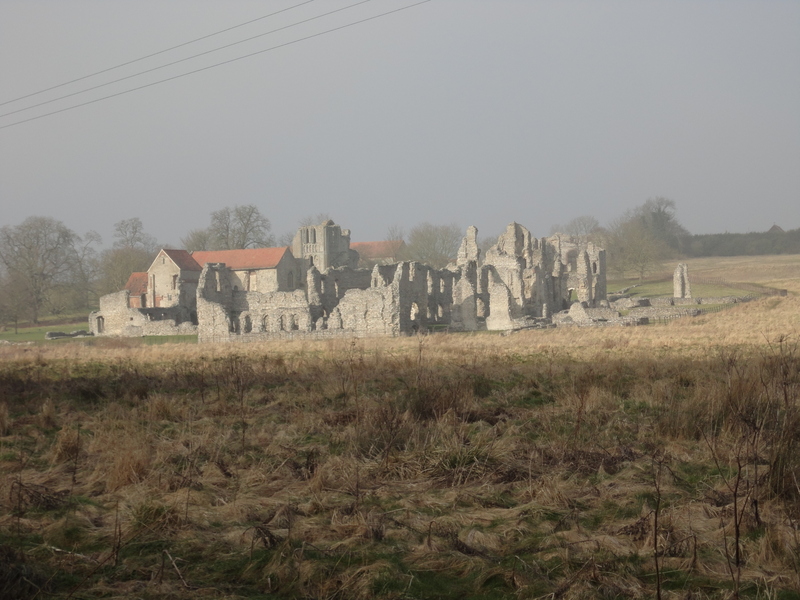 I didn’t go around the Priory unfortunately – I should really have allowed myself more time in Castle Acre, but I didn’t realise quite how interesting it was likely to be. I’m sure the young dog would like the bike – goggles on, ears blowing in the wind…. Great stuff! What’s the thing in the first photo? a windsock? Awful about that fly-tipping. 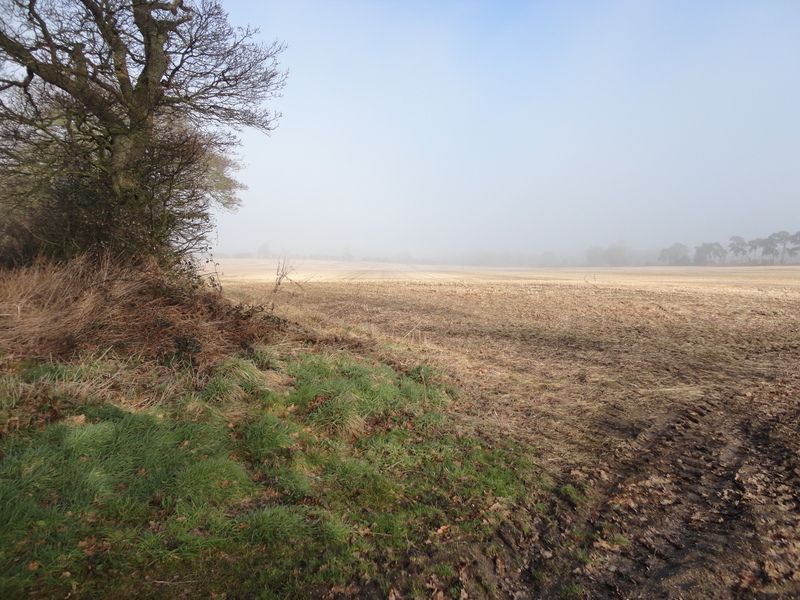 I suppose we have it here too but it’s usually much more hidden as our landscape isn’t so open so it doesn’t look as obvious – still as annoying though! Thanks Carol! I must say, you nearly threw me then coming through under a different ‘name’! I think that thing in the first picture is for scaring birds. 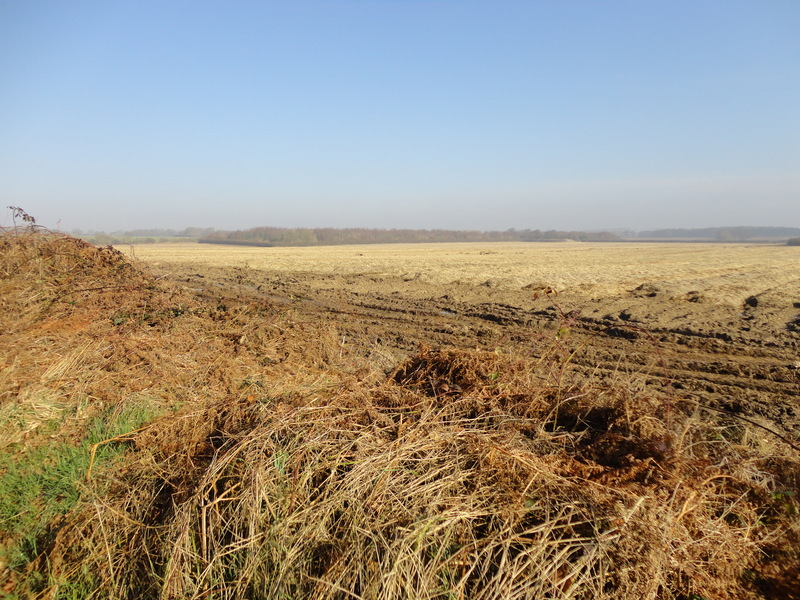 There’s a lot of arable farming in the area and consequently lots of bird scaring – some of it quite noisy – to protect the crops. I’m not sure what crops they tend to grow there though, as most of them hadn’t yet grown enough for me to try and identify them. Yes, the fly-tipping is horrible isn’t it? We get it round here too. I can think of a particular place only about 3 miles away from our house which is absolutely dreadful, only as you say, it is a bit more hidden with the terrain. For some reason, WordPress blogs weren’t recognising me as ‘me’ even though I was logged in to comment! 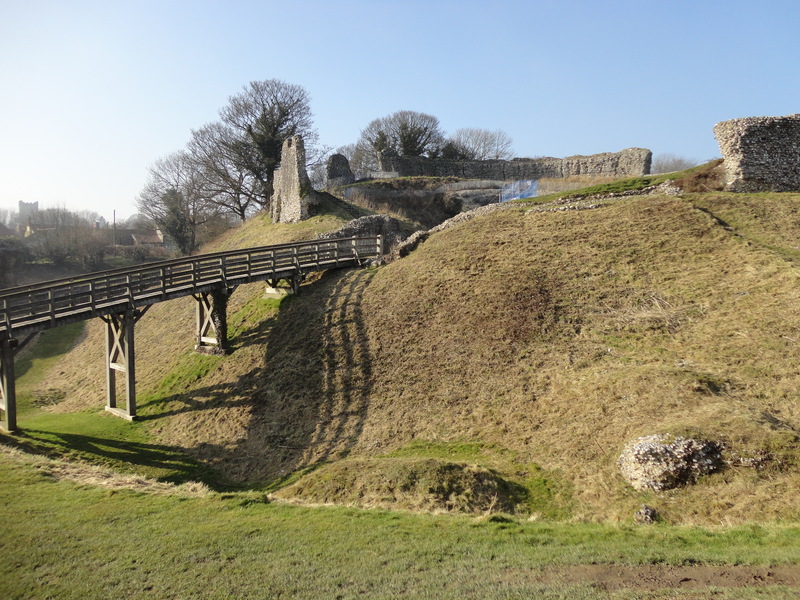 Castle Acre looks great, excellent write up as always. 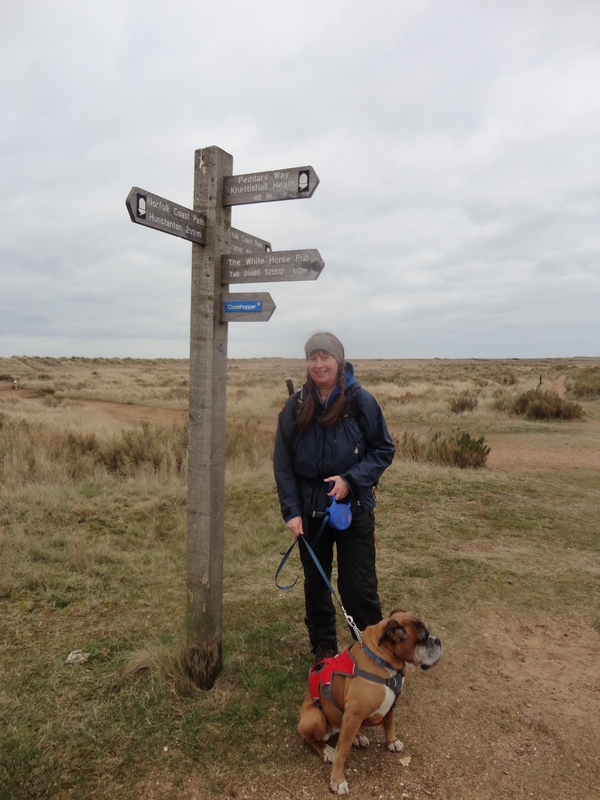 I want to do the Norfolk Coast Path soon. Even less up and down. 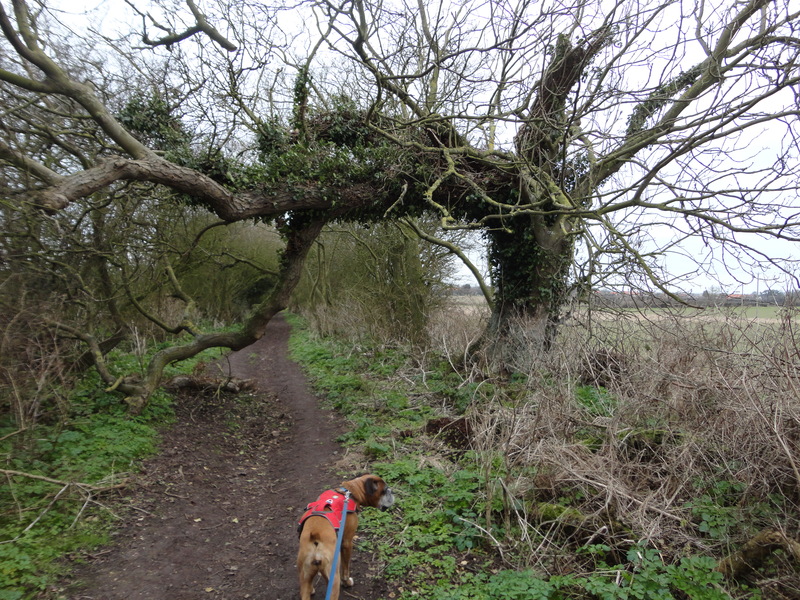 I think the Peddars Way is an excellent walk. Lovely write up there Chrissie. I bet it felt a bit lonely without Dixie. It looks like the weather stayed ideal for the whole off your walk. Thanks Mike, it was super weather, I couldn’t believe my luck really! 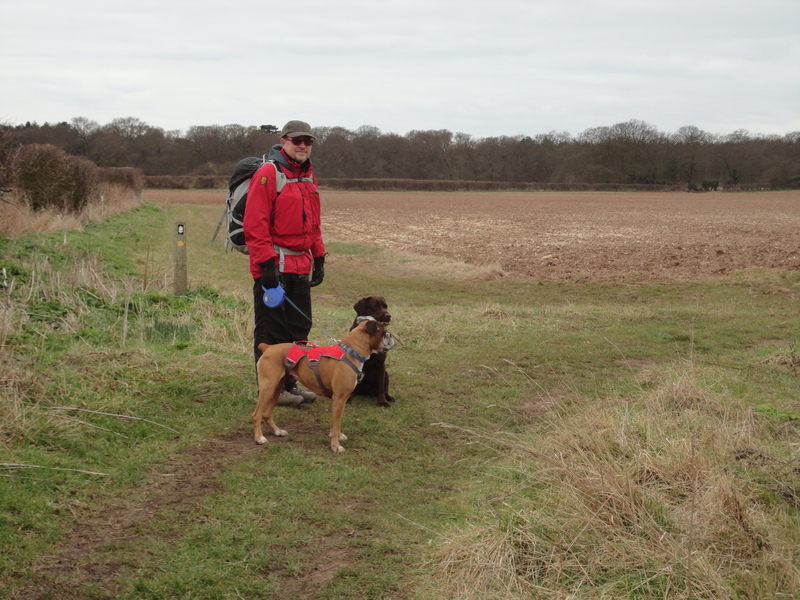 It was a bit odd on the 2 days I walked without Dixie – you take their company for-granted until they’re suddenly not there to chat to! 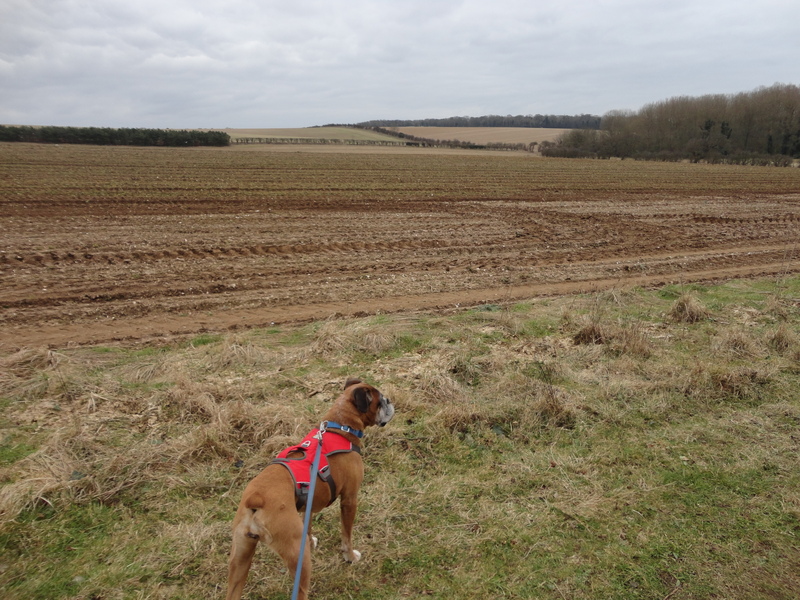 Looks like an interesting walk……..who needs hills?! Exactly! And ‘a change is as good as a rest,’ as they say! Great stuff Chrissie. 😀 Jackie and I were talking about a trip to Norfolk only a couple of weeks ago…mainly because we’ve never been in that part of the world. I might be able to persuade her to tackle some of that walk based on your report. That Norman settlement looked amazing. PS. Sorry to hear about Dixie’s deafness. Doesn’t appear to have slowed her down judging by how tight that lead looked. Have you gone deaf yet with her increased barking volume? Thanks for that, Ken 🙂 Yes, Norfolk has certainly left its mark on me. Of course I’ve no idea how different it may or may not feel at other times of the year, but we certainly found it incredibly peaceful and relaxing, and there are obviously miles and miles of trails to walk. We need to go back and look at that Norman settlement actually, as Geoff didn’t get to see it. I want to go and have a good look around that ruined Priory, too. And as for Dixie’s deafness, no, it certainly hasn’t slowed her down and yes, her increased barking volume can be almost too much for the old ears to bear at times!